EghtesadOnline: Iran traded 4.83 million tons of non-oil commodities worth $2.47 billion with the nine member of the Commonwealth of Independent States, namely Russia, Azerbaijan, Kazakhstan, Armenia, Uzbekistan, Tajikistan, Kyrgyzstan, Belarus and Moldova, during the 11 months to Feb. 19, 2019. Imports stood at 2.18 million tons worth $1.35 billion, up 43.21% and 59.3% in tonnage and value respectively YOY, Financial Tribune reported. The Commonwealth of Independent States, also known as the Russian Commonwealth (in order to distinguish it from the Commonwealth of Nations), is a political and economic intergovernmental organization of nine member states, all of which are former Soviet Republics located in Eurasia (primarily in Central to North Asia), formed after the dissolution of Soviet Union. Azerbaijan Republic joined CIS after the withdrawal of Turkmenistan. Ukraine withdrew its associate membership in May 2018, Georgia withdrew its membership in 2008, while the Baltic states (Estonia, Latvia and Lithuania), which regard their membership in the Soviet Union as an illegal occupation, chose not to participate. Iran mainly exported liquefied natural gas, pistachios, kiwis, Portland cement, apples, tomatoes and dates to CIS countries. In exchange, major commodities imported into Iran from CIS nations included nuclear reactors’ parts, barley, field corn, sunflower oilseed, radio navigation devices and sheep carcasses. In terms of total trade value, Russia topped the list among CIS countries by trading 2.23 million tons worth $1.38 billion with Iran, up by 37.28% and 57.57% in tonnage and value respectively YOY. Exports to Russia amounted to 428,560 tons worth $246.45 million to register a 2.45% and 5.98% growth in tonnage and value respectively YOY. Russia was Iran’s second biggest export destination among the countries under review and 16th among all countries. In return, Russia exported 1.8 million tons of commodities worth $1.13 billion to Iran, up by 49.35% and 76.12% in tonnage and value respectively YOY. Russia was the top exporter of goods to Iran among CIS members and eighth among all countries. Major Iranian commodities exported to Russia were kiwi, apples, tomatoes and pistachios. For its part, Russia mainly exported nuclear reactors’ parts, field corn, barley and sunflower oilseed to Iran. Azerbaijan was Iran’s second biggest trading partner among CIS nations during the 11 months, as two-way commercial exchanges stood at 803,100 tons worth $389.33 million to register a 27.61% and 29.66% growth in tonnage and value respectively YOY. Iran exported 758,250 tons of goods worth $370.7 million to Azerbaijan, up by 33% and 33.34% in tonnage and value respectively YOY. Azerbaijan was Iran’s top export destination among CIS countries and 12th among all countries during the period. Iran’s exports to Azerbaijan included liquefied natural gas, potatoes and chemicals. Iran imported 44,849 tons of commodities worth $18.63 million from Azerbaijan, down 24.23% and 16.35% in tonnage and value respectively YOY, which mainly constituted non-alloy semi-finished iron/steel products, oilcake and chemicals. Azerbaijan was the seventh exporter of goods to Iran among CIS members and 61st among all countries. Kazakhstan was Iran’s third major trading partner among CIS countries. Mutual trade between Iran and Kazakhstan amounted to 683,461 tons worth $200.05 million, indicating a 47.99% rise in tonnage and 0.15% decrease in value YOY. Iran’s exports reached 414,741 tons worth $120.82 million, up 43.54% in tonnage and down 18.04% in value YOY, while Kazakhstan’s exports to Iran were at 268,719 tons worth $79.23 million, up by 55.44% and 49.67% in tonnage and value respectively YOY. Kazakhstan was Iran’s fifth export destination and second exporter of goods to Iran among CIS members. The country was Iran’s 29th export destination and 35th exporter to Iran among all countries. Pistachios, dates and Portland cement were Iran’s main goods exported to Kazakhstan, while Kazakhstan exported mainly barley, sheep carcasses and colza seeds to Iran. Armenia was Iran’s third biggest export destination, after Azerbaijan and Russia among CIS countries and 26th among all countries, as Iran exported 506,714 tons worth $143.46 million to Armenia during the 11-month period, up by 95.91% and 39.03% in tonnage and value respectively YOY. Iran mainly exported bitumen, liquefied natural gas, pistachios and non-alloy semi-finished iron/steel products to Armenia. 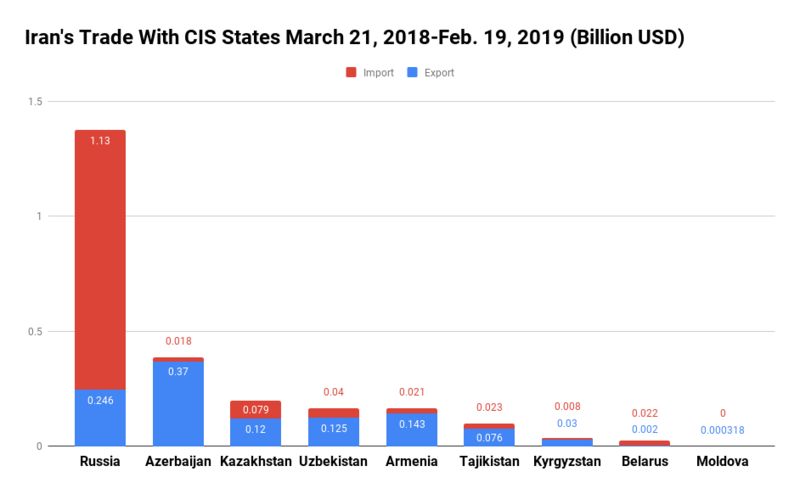 Uzbekistan was the third biggest exporter to Iran, after Russia and Kazakhstan, among CIS countries and 46th among all countries, as Iran imported 33,132 tons worth $40.63 million from Uzbekistan during the period, down by 20.92% and 31.18% in tonnage and value respectively YOY. Iran mainly imported cotton, yarn and chemicals from Uzbekistan. Trade with Russia (at $1.38 billion), Armenia (at $165.46 million) and Azerbaijan (at $389.33 million) saw the highest YOY growths of 57.57%, 30.32% and 29.66% respectively, while trade with Tajikistan (at $100.07 million), Belarus (at $24.88 million) and Moldova (at $618,245) witnessed the lowest declines of 53.78%, 15.74% and 2.51% respectively. Iran’s exports to Belarus (at $2.32 million), Uzbekistan ($125.65 million) and Armenia ($143.46 million) saw the highest growth of 42.77%, 40.09% and 39.03% respectively, while exports to Tajikistan ($76.44 million), Kazakhstan ($120.82 million) and Kyrgyzstan ($30.12 million) witnessed the highest decline of 62.55%, 18.04% and 11.26% respectively. Imports from Tajikistan ($23.62 million), Russia ($1.13 billion) and Kyrgyzstan ($8.61 million) saw the highest growth of 90.28%, 76.12% and 68.38% respectively while imports from Uzbekistan ($40.63 million), Belarus ($22.55 million) and Azerbaijan ($18.63 million) witnessed the highest decline of 31.18%, 19.15% and 16.35% respectively.